ZePrA is a sophisticated color server for MacOSX and Windows. It allows to color convert PDF and Pixel files with ICC or DeviceLink profiles automatically. ZePrA closes the gap between manual color conversion and the use of a complex and expensive workflow solution efficiently. What's new in Zepra 5? ZePrA 5 is a major new version of our color server. It addresses several new features our clients have requested. The first of the two main new features is regarding speed improvements and multithreading. The second is the additions to the spot color handling and reporting. There are several other new features as well, including improvements to the user interface. These new features make ZePrA 5 a must have version for existing clients, as well as new clients. The new Spot Color Report feature is helpful to check the spot color conversion before printing. The biggest changes of the GUI will show up when opening the Configurations dialog. You will find that fewer tabs are used. The Document / Target tab is the new center of each configuration as it contains the settings for Document Color Space, all Target color management settings and the SmartLink Method. More features have been added and the dialog looks cleaner compared to previous versions of ZePrA. If you wish to enable the advanced Spot Color Conversion simply select the radio button. Sorting for Queue Names, Configurations and Status is now enabled by clicking on the table headers. Previously, sorting of Queues was not possible. In addition, a queue ID has been added which allows for "natural" sorting, e.g. with the newest queue either on the bottom or the top of the list. In the Auto Setup Wizard for Save Inks a new step has been added that allows the user to enable or disable the ink saving calculations. By defining a shared folder in the Cloud, (e.g. Dropbox, GoogleDrive, internal Cloud or network) it is possible to share configurations, spot colors and ICC profiles easily. In the Flattening dialog a new option has been added that allows to Use the document colors space as transparency color space on page level. Zepra 5 added the Minimal Compression rendering as an additional perceptual rendering option for the SmartLink conversion. Similar to CoPrA and ColorAnt each major dialog in ZePrA 5 has a new question mark sign that leads directly to the help pages. This option will reprocess a job and in the same queue without you having to retrieve the file and copy it manually in the Input folder of the queue. This is a very useful function on the Configuration/PDF tab in section Advanced Options when a multi page PDF is used for a variety of printing tasks or display outputs. Overview - Access ZePrA's Overview Screen. View queues, pending jobs, processed jobs. Configurations can be assigned to Queues at any time and the order in which queues are processed can be controlled, allowing control over specific queues raising or lowering priority for file processing. Spot Color Report - is helpful to check the spot color conversion before printing. You can either check a specific PDF file with spot colors that needs to be converted or how a spot color library with multiple Pantone or other spot colors would be processed through ZePrA. SaveInk Report - Generate a SaveInk report by either right-clicking on jobs under Processed or by clicking on the icon via the Navigation Panel. The report generates a detailed overview of all the SaveInk queues set up and processed jobs. Extract ICC Profile - extracts the embedded profile from images and the output intent from PDF/X files. The extracted ICC profile can then be stored in a predefined location. Spot Color Libraries - Allows optimized conversion of spot colors in PDF files into CMYK. If the ZePrA XL package or Multicolor has been licensed, (which includes the Spot Color module), it has the ability to monitor Multicolor spaces and to convert spot colors to Multicolor. Gradations - The application of gradation curves completes the process of preparing data for printing. Shortly before going to press, almost every printing process calls for a tone value correction(TVI) that is stored in the RIP of the platesetter. Profile Assignments - Profile Assignments is an option in conjunction with SmartLink that enables the use of existing, already tested or special DeviceLink profiles that are based on the ICC standard for converting your data. ZePrA converts all Images, including vector shading, with the highest accuracy and 16-bit precision. Color convert PDF and Pixel files with ICC or DeviceLink profiles automatically. CLI module is required for Switch integration as it includes CLI capabilities. ZePrA automatically configures all the necessary Hot Folders and is instantly ready to process PDF, TIFF, JPEG or PSD files for the CMYK, RGB, Grayscale, Multicolor color spaces and spot colors. Creating a queue for a PDF/X-compliant workflow will setup the descriptive parameters for the output conditions automatically. The ColorLogic SmartLink function permits dynamic generation of DeviceLink profiles, taking various factors into consideration, such as preservation of the separation characteristics, use of the TAC of the target profile, preservation of pure colors with simultaneous dynamic gamut mapping. Many options are available allowing users to define how SmartLink shall create the DeviceLinks, optimized for traditional printing like Offset, Gravure or Newspaper or targeted for Digital Printing or Large Format Printing. Users can also have their own preferences regarding color conversion by adjusting SmartLink with their own DeviceLink presets, since CoPrA SP is part of the SmartLink package. SmartLink enables users to compensate deviations from either their home standard or to the desired printing standard. XL package offers SaveInk profiles for user's house standards. Select either one of the three preset saving options (SaveNeutral, Strong Save or SaveMax), or use CoPA SP to make presets and apply them directly in ZePrA. Reprofiler SP(serialized profile), is a part of the SmartLink package and it’s generated profiles can be easily integrated in ZePrA.The comprehensive XL package will automatically create SaveInk profiles for your own house standards. Select either one of the three preset saving options (SaveNeutral, Strong Save or SaveMax), or use CoPA SP to make your own presets and apply them directly in ZePrA. Spot color solution is aimed for packaging printers which have to deal with numerous spot colors and need to optimize their printing process by converting spot colors into CMYK or Multicolor process colors. 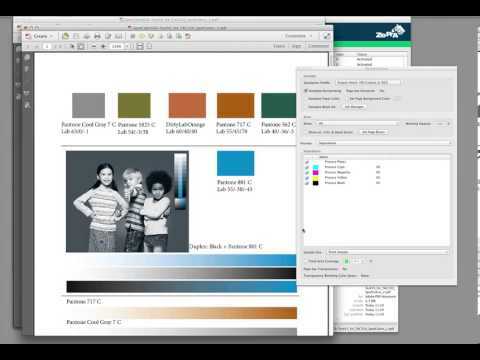 ZePrA uses spectral data and spot color libraries and can optimize colors based on custom conversions. The new Spot Color Report feature is helpful to check the spot color conversion before printing. You can either check a specific PDF file with spot colors that needs to be converted or how a spot color library with multiple Pantone or other spot colors would be processed through ZePrA. Gradation curve corrections ensure compliance with printing standards and is helpful to compensate variables in the printing process. The printing characteristics can be directly included in the data. You may apply curves on process and spot colors. Gradations allows last minute changes to data, too. Integration with Enfocus Switch is made to realize a complete workflow - from data receipt, to data checking and color conversion, all the way to data distribution.